Entry for most pupils is via the Common Entrance Examinations. This is set by the Independent Schools Examination Board. Further information and past papers are available from their website (www.iseb.co.uk). Some pupils will sit the Scholarship Examination. A few applicants attend schools, in the UK or abroad, that do not follow the Common Entrance syllabus. These pupils sit our own entrance examination in January of the year of entry plus an online aptitude test. This examination is limited to papers in English, Mathematics and Science and is normally taken at King’s. Our experience is that good results at GCSE and A Level can be obtained by pupils with a wide range of CE entry marks, and therefore we do not follow a narrow and inflexible criterion towards selection. Individual character and circumstance, together with the ability to contribute widely to the extensive range of co-curricular activities, are also taken into consideration. Open Days are held on a Saturday morning in each of the three terms. The first step in the admissions process is to Register and submit the online Registration Form along with a non-returnable registration fee of £200. This can be completed for pupils of any age and parents will receive regular updates to keep them informed about the School. Approximately two and a half years ahead of entry, the Registrar will contact the pupil’s current school to request a formal reference. On receipt of a positive reference, the Registrar will write to parents with a formal offer of a place, subject to the usual Common Entrance requirements. It is quite deliberate policy not to add pressure on young pupils by operating a Pre-test in Year 7, so the reference is of significant importance in the Admissions procedure. A place is confirmed through the payment of a deposit. On payment of a deposit, parents can revisit the School with their son and/or daughter to meet several Housemasters/Housemistresses at their respective Houses. 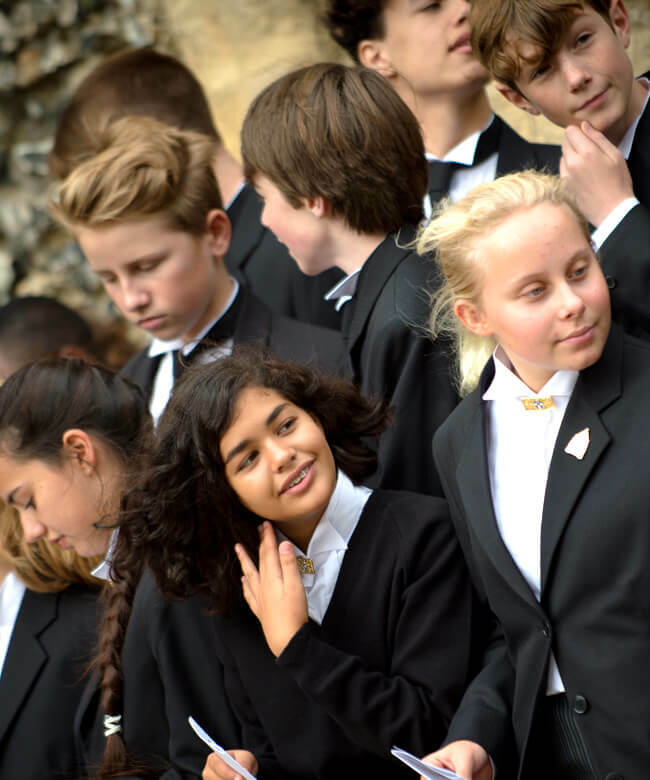 A preference for a particular House may then be expressed, but the Admissions Department will always wish to provide each House with a balanced intake in terms of pupils’ talents and backgrounds. Academic Scholarship Examinations are held at the School early in the Summer term prior to September entry. The Common Entrance Examination is taken at the pupils’ current schools in the middle part of the Summer term prior to September entry. Details of Academic, Music, Art, Sport, Drama, Dance and Design Technology scholarships.